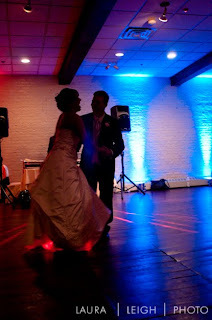 Ambient DJ kicked off its 2010 wedding season with a great one! After one of the most treacherous winters on record, the wedding couple, Lisa and Jordan, were rewarded with an idyllic day! Clear blue skies and comfortable 70 degree weather on March 19, 2010. Had their wedding been held last weekend, it would have been a cold, rainy affair. Had it been three weekends ago, it would have been in the midst of a blizzard. This pleasant turn of events could not have happened to a nicer couple! The historic Smithville Inn is located not far from Atlantic City, off Exit 48 on the Garden State Parkway. I had not been back to Smithville since my childhood years. The venue had a rustic, country feel, with white brick walls, dark hardwood floors and wooden beams. The view out the windows was of a picturesque lake. Outdoors, exotic mallards strolled about. 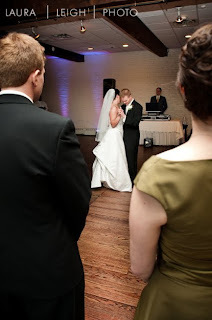 Ambient DJ provided ceremony music in a separate room. The bride opted to walk in to Pachelbel's Canon in D, a classic choice. 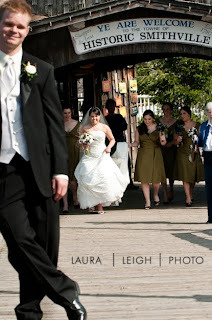 The recessional song was Ray LaMontagne's "You are the Best Thing." Cocktail hour was in the same room as the ceremony, and I unveiled my 2010 cocktail hour selections, featuring a mix of mainstream jazz, soul, rock and lush electronica. For the main event, a crowd of slightly less than 100 settled into the cozy banquet hall. 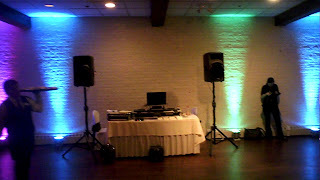 The DJ table was situated at the back center of the room, immediately in front of white brick wall. I set up four par cans in purple, to match the color scheme, and provided uplighting, projecting lighting up the wall and transforming the ambience. Later in the evening, I tried different colors and had the cans running on slow auto-fade programs. 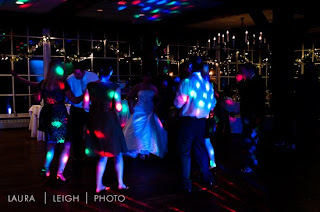 Special songs - Grand Entrance - "Thunderstruck" - AC/DC, First Dance - "If I Had the World to Give" - The Grateful Dead, Cakecutting: "1, 2, 3, 4" - Plain White Tees, Closing Set: "Hey Jude" - The Beatles, "Don't Stop Believin'" - Journey. Other keys tracks "Shake Your Groove Thang," "Wonderful Tonight," "Poker Face," "Have I Told You Lately" (Van Morrison version). Some notable unusual happenings - the Father of the Bride's speech was particularly long and controversial! The Father of the Groom invited to show me around Germany on my next trip there (the parents of the groom are expatriates). 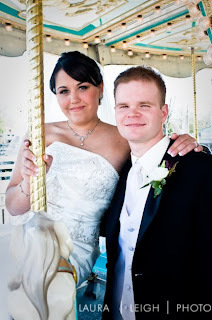 Shout-out to Laura Perry from Laura Leigh photo for providing some of the photos below. You can visit her on the worldwide web at www.lauraleighphoto.com.